A plastics processing facility with the capacity to transform more than 200 million plastic drink bottles into high grade food-safe packaging, annually, opened its doors for business on Wednesday in Lower Hutt. The project gives New Zealand, for the first time, the capacity to recycle polyethylene terephthalate (PET) plastic into food safe packaging. Flight Plastics will be able to recycle 6000 tonnes of the 8000 tonnes of PET plastic collected for recycling each year in New Zealand. New Zealand currently imports around 20,000 tonnes of virgin PET every year. China’s recent ban on importing waste and recyclables has narrowed the number of end markets for recyclables, creating an incentive for New Zealand to recycle onshore. 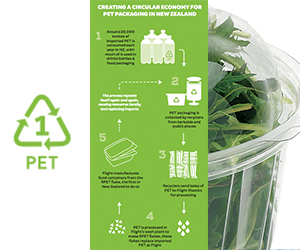 With the introduction of this inaugural PET wash plant in New Zealand, PET bottles, trays and punnets collected at kerbside around New Zealand can be baled and turned into new PET food-grade packaging, reducing the need to import virgin PET. Flight received NZ$4 million in funding from the government’s Waste Minimisation Fund.